We’ve told you it was coming. We’ve shown you the concept art. With the advent of having a Rapunzel in our own house for Halloween, we had to take a run down to the park to get some photos of the heroine herself – with our miniature version, of course! 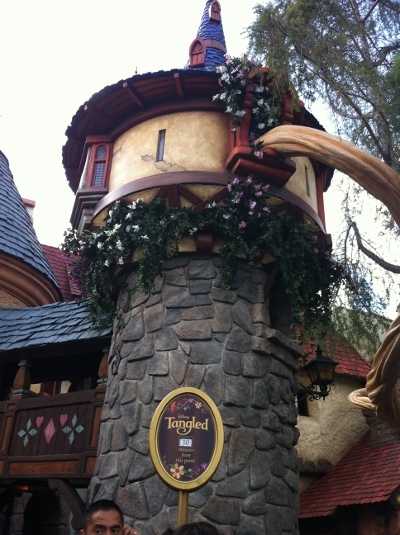 Therefore, we took ourselves on an adventure to the new Tangled cottage in Disneyland’s Fantasyland, on Saturday afternoon in order to make this happen. As we mentioned before, the “meet and greet” took over the spot of Gepetto’s Sweet Shoppe, in Fantasyland, at the corner where the paths turn left toward Pinocchio’s Village Haus and the Frontierland Stockade. 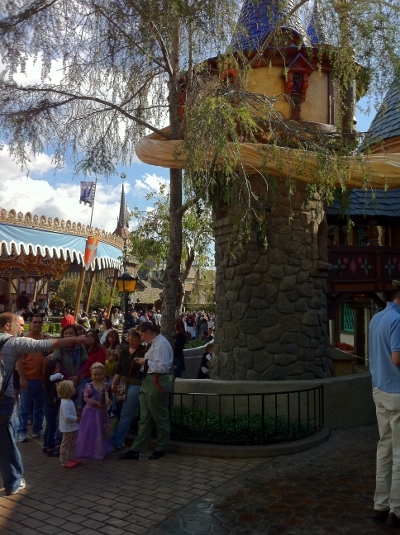 They incorporated existing tower architecture from the Pinocchio ride, as well as a small shop space. And when I say small, I mean so uncomfortably small that they couldn’t have candy on freestanding shelves – only wall hangings and a register counter. Taking the existing fixtures out made for the perfect “meet and greet” space. 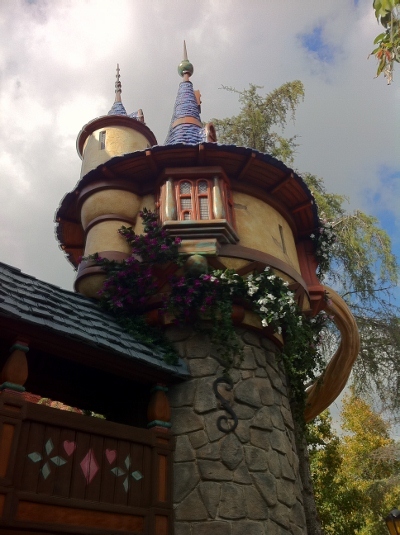 Its traffic and access is easily controlled and there is a definite sense of anticipation to enter the little cottage that is the world of Rapunzel. We were actually in the park a week before the cottage was to open (for Mickey’s Halloween Party) and there was absolutely no sign that Disneyland was doing anything to get the area ready. Nothing. The tower looked nothing like the concept art or the movie trailers. Of course, this led us to question how it was going to be accomplished. In discussion with my other Disneyland Correspondent colleagues, we figured it had to be some sort of retrofit, which could simply be overlaid/attached to the existing structure. When we went on Saturday, sure enough – we were right. An overlay is the simplest choice – no demolition, no earthquake or other special construction approvals, and (best of all) the work can be done out of sight of the guests. That’s Disney Magic at its finest!!! 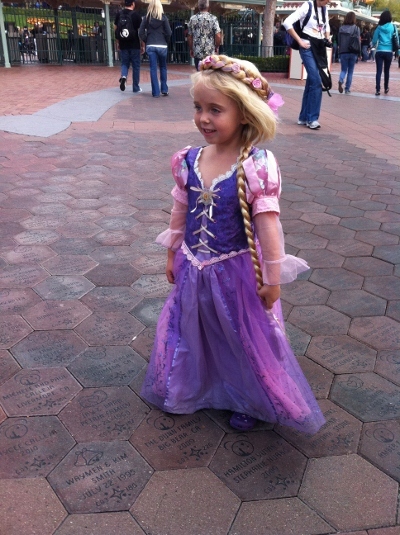 Having a miniature Rapunzel with us, as we made our way through the park, was quite the bit of fun, too. 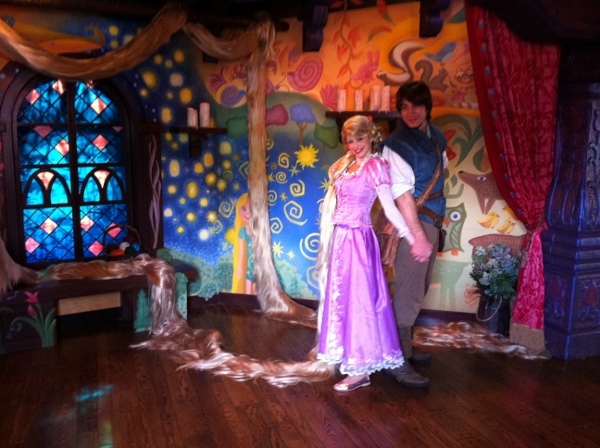 Since the movie isn’t released yet, they don’t have Rapunzel’s dress for sale at any park locations yet. It’s only available through the Disney Stores – so it was almost as fun for the Cast Members to see her dressed up as it was for her to do so. Everywhere she went, she was greeted by “Hello, Princess.” I actually asked a couple of them if she is really a princess or not in the Disney version, since we really haven’t been told yet. It seems to me that they are positioning her more as a heroine…. Would you believe that the ones I asked didn’t know???? But I digress…. 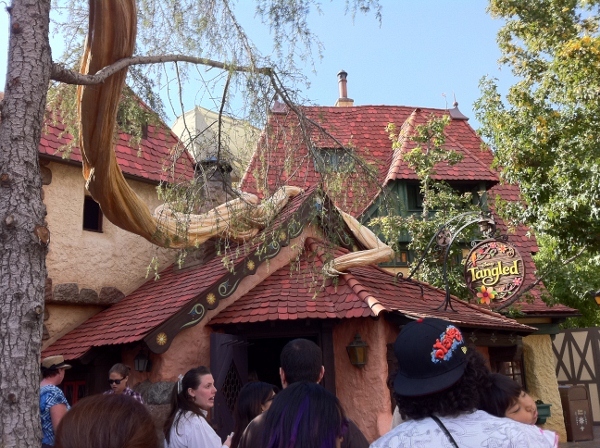 When we arrived at the queue to the Tangled cottage, it was about 1:30 pm and we were honestly surprised to find it about a 15-20 minute wait. 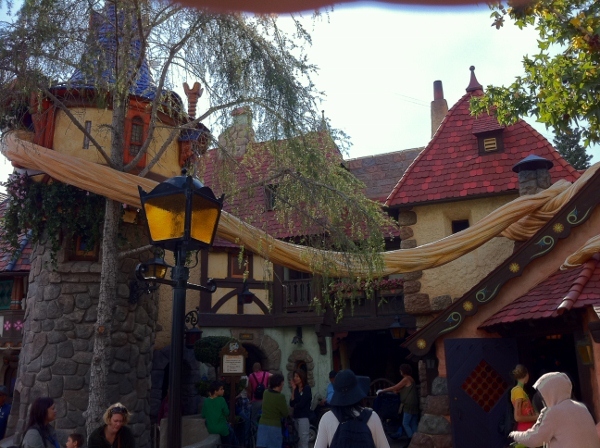 Rapunzel’s waiting line occupies some unused/existing overflow queue space from the Pinocchio ride. This is great planning, as the line doesn’t hamper the flow of Fantasyland traffic. The queue looks like it can hold up to a 45 minute wait, but ours was just enough time to have a quick snack in line and check out the architectural details of this new addition. The Tower detail is flawless, with small bougainvillea plants gracing the underside of the new addition to help it blend with the old architecture. 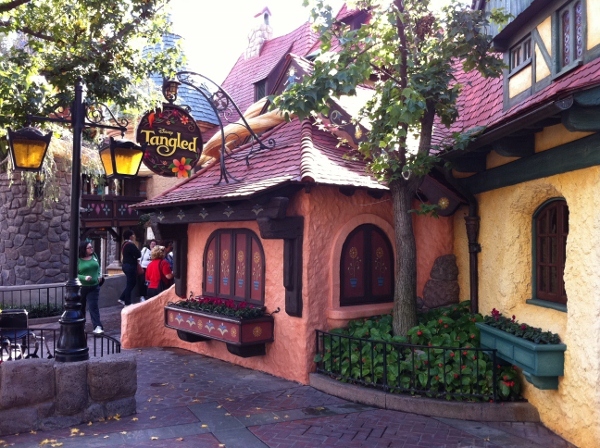 The old cottage/shop didn’t really need any work, thanks to the creative forethought and generic medieval design of the Imagineers responsible for the 1983 remodel of Fantasyland. Of course one of its principal visual features was the biggest question on everyone’s mind – “How are they going to pull off the HAIR?” Okay. Maybe it wasn’t on everyone’s mind, but I know I asked that question! Our queue twisted and turned until we finally got a glimpse into the cottage from the front of the line. I enjoyed the fact that the line was entirely outside the cottage and you weren’t allowed close to the door until they were ready for you. Then, you were brought up to the door like a true visitor! You couldn’t really even get a peek inside, until you hit that coveted pole position – see, that’s us at the front of the line. 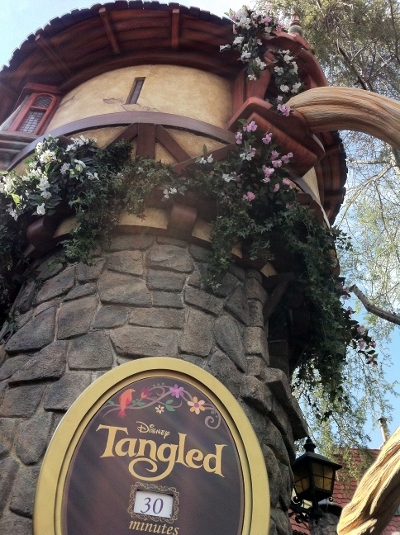 We even got a little Tangled swag, once we were there – little bookmarks. Both girls just thought these were fabulous and wouldn’t let go of them. The Cast Member at the head of the queue even told our Rapunzel that it was for HER movie! Once you were welcomed in, though, you were in for something charming. 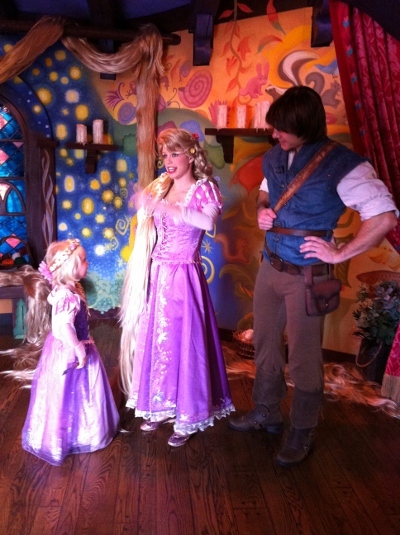 I asked our Rapunzel (Zoe) what she thought about waiting in line to visit. She said that it was “super weird (I think that means “neat”) to see her hair all over the roof” and that “her house was really hairy!!! !” after we went inside. 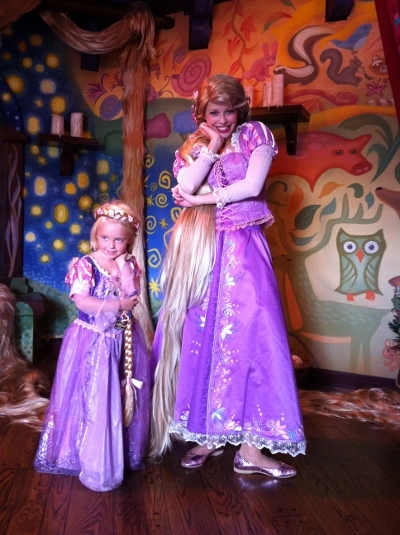 Rapunzel seemed genuinely thrilled to see a miniature version of herself in her cottage. Like I said, her dress isn’t out at Disneyland merchandise locations yet, so any child with that dress on had to haul it from home. They had quite the private conversation for several minutes and then Rapunzel was very gracious and taught Rapunzel Zoe her “signature poses”. Indeed it made for a lovely visit. 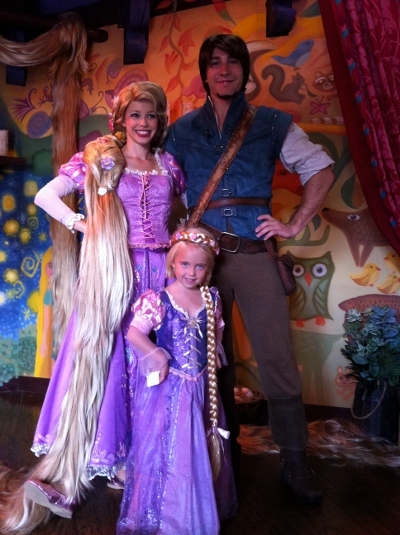 You can tell Rapunzel Zoe was thrilled to meet them and share a special moment. Now you can take your own photos, but of course there is a Photo Pass opportunity inside the cottage, should you want to take advantage of that service. Remember, that you can have the Photo Pass assistant use your camera too. Where was Lily during all of this, you ask? Clinging to me like an intrigued, yet suspicious monkey. Characters just have never been quite her thing – the polar opposite of our glamorous, top model Zoe. It was certainly a great experience that I think we will find ourselves repeating quite a bit! Times Square Disney Store – The Magic is Back! Are You “Brave” Enough to Meet Merida at Disneyland?